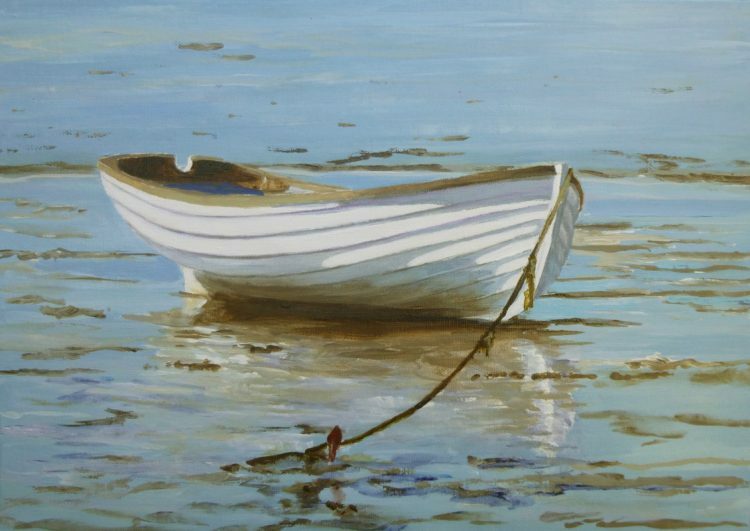 The last day of August, so here is the next Canvas Print – a very summer-y one of a little West Mersea dinghy at low tide, sitting on the mud in the sunshine. This canvas print is available in a limited edition of 6, as usual, and can be purchased direct on the Canvas Prints page of this site for £28.00 including packing and postage to any UK mainland address. The original painting of Waiting for the Tide III was one of four paintings I’ve sold so far at the Haylett’s gallery over the summer. 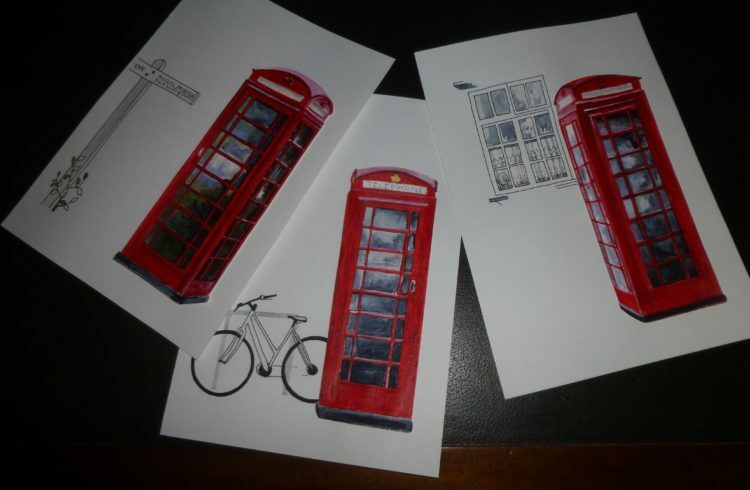 I have been really busy getting prepared for Open Studios – I finished painting my telephone boxes, and have turned them into Christmas Card designs and ordered them from the wonderful www.moo.com. 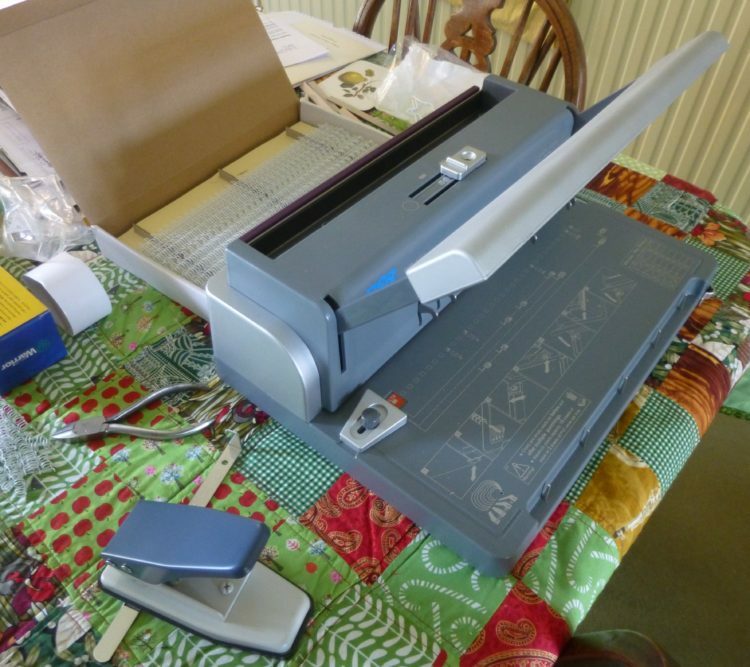 Last night I got out the new calendar binding machine, and after a few trials, got the hang of using it . . .
. . . and have spent a lot of today binding calendars! – so I haven’t yet started painting Essex Wood: August! But I have been doing some little paintings – of red telephone boxes – which are going to be the basis for my Christmas cards this year, which will go on sale at my Open Studios in September. 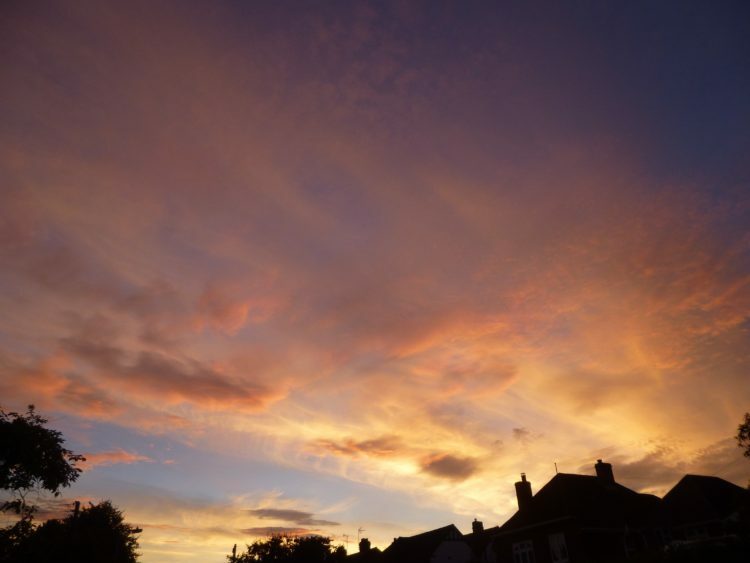 They are from a variety of places – Salisbury, Avebury, and Piccadilly, as well as two local ones, one from Wormingford, and one from Lexden, outside the old Sun Inn. Can you guess what the strap line will be? A free pack of 5 cards for the first correct guess left with your email address in the comments, or on my Sally Pudney Artist Facebook page, before the end of August! (UK mainland only – sorry!) Get your thinking caps on! 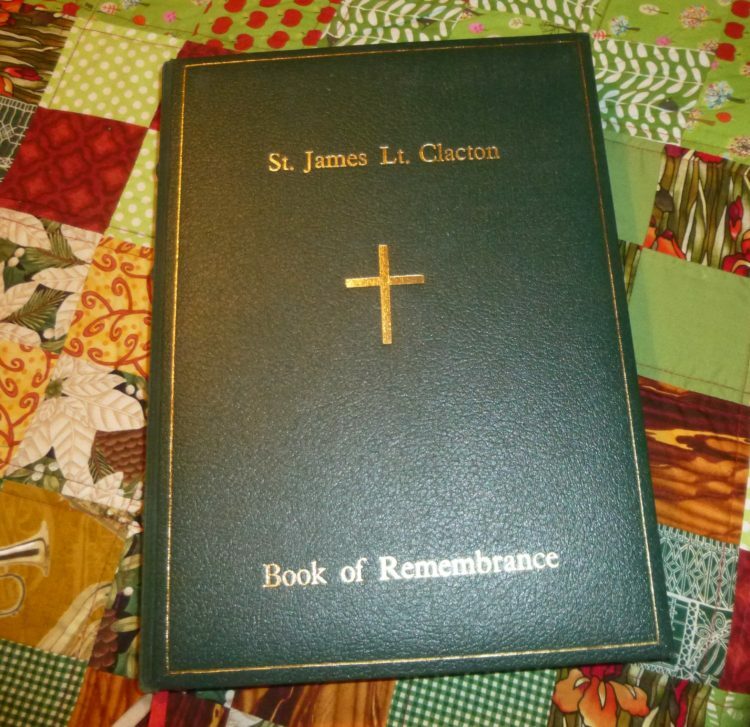 Book recommendations are not usually something I blog about, as not really connected with art, but recently I have read three books one after the other, which I really thought were excellent. So here are three recommendations if you’re looking for a really good read for the last few weeks of the summer . . .
‘Weatherland’ by Alexandra Harris – a brilliant and fascinating look at our English relationship with weather as shown in art and literature, from the very earliest recorded images and texts. It probably helps your enjoyment if you have a reasonable knowledge of English literature, but having said that, I have no knowledge of Anglo Saxon and found that part particularly interesting. 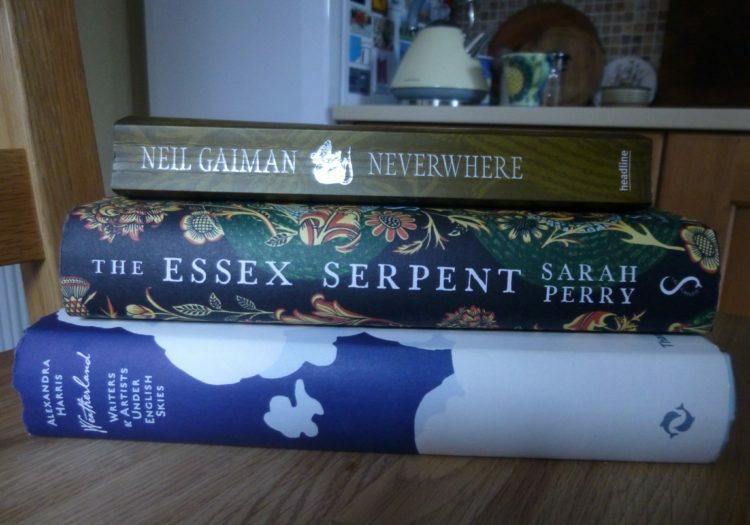 ‘The Essex Serpent’ by Sarah Perry – a strange and haunting novel, centred on the Essex Marshes, the Blackwater Estuary and Colchester in the 1890s. ‘Neverwhere’ by Neil Gaiman – I never usually read fantasy, but I heard a little bit of the Radio 4 version of this, and was intrigued – and it is really gripping! I’ve been spending quite a bit of time over the last week preparing for my ‘Open Studios’ weekends in September. This time I’m making two different calendars, and have printed off all the pages for them both. One is my usual mix of paintings that I’ve done this year, and the other has all twelve of my little ‘From my Garden’ still-life paintings from this project which I did through last year. 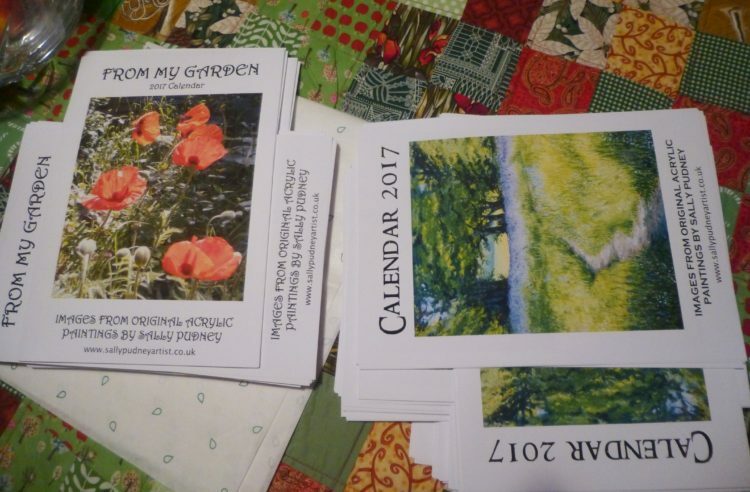 I’ve put a photo of beautiful oriental poppies from my gravel garden on the front cover, as you can see – one of my favourite flowers, but one which I didn’t paint, so I got them in this way instead! 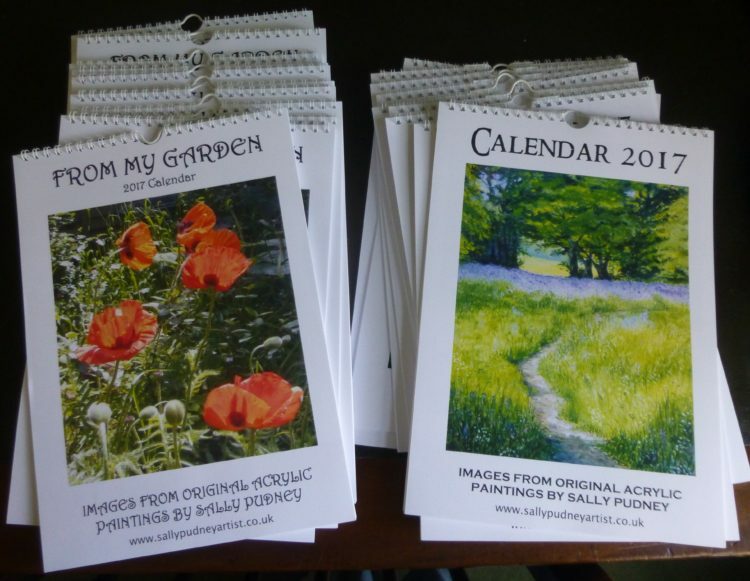 My next job is to have a play with my new calendar binder, which puts on the white coated binding wire, and use my new thumb hole punch – I shall definitely be trying out on some scrap paper first, until I’ve worked out how to use it! Yesterday morning I made my August visit to the wood. 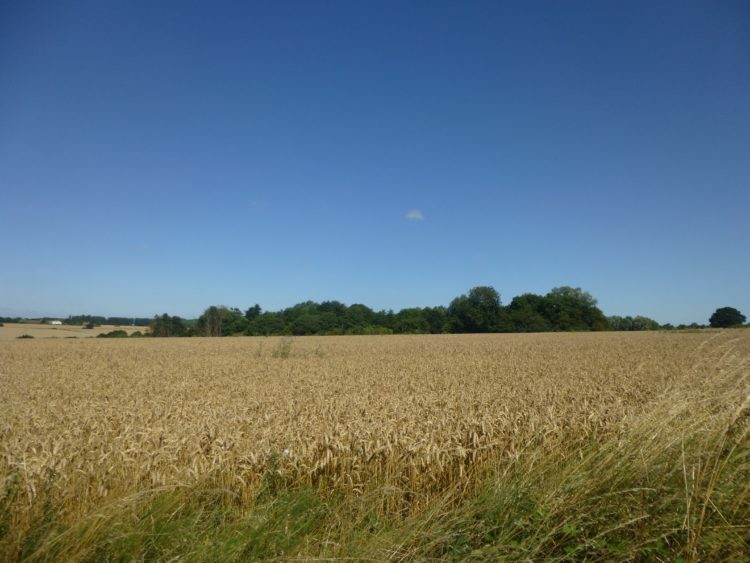 As I walked down the track from the old church, the un-cut wheatfields on either side were as level as a table top, and the banks thick with tall thistles – some still showing purple, but many had gone to seed and the air was full of the blowing thistledown. I heard a buzzard and after surveying the clear blue sky for a moment or two, saw it sailing high up over the fields behind me. It was a hot, breezy day, and for the first time since the Spring, the chief sound inside the wood was the wind in the trees. There was no birdsong at all, and I only saw one woodpigeon, one squirrel, and a few bees. 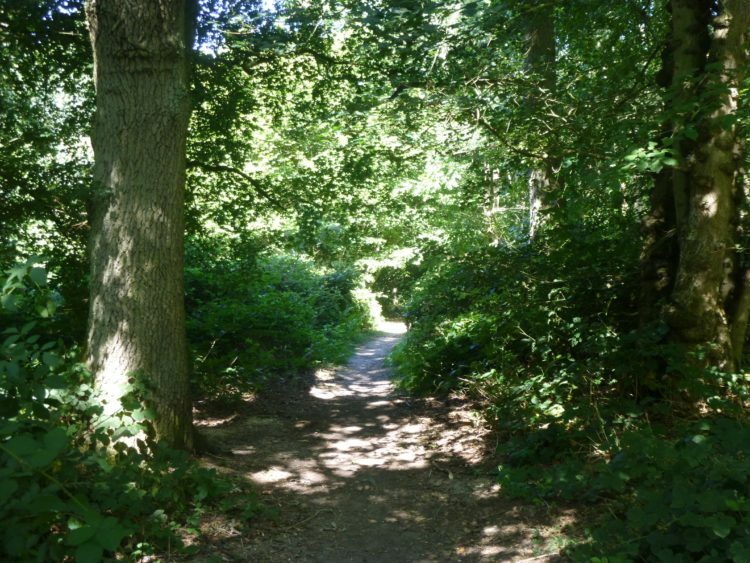 I thought the wood would be swarming with buzzy, bite-y things, so had sprayed myself very thoroughly with ‘jungle strength’ insect repellent – either it was exceptionally effective, or there really were very few insects about: I didn’t get a single bite! 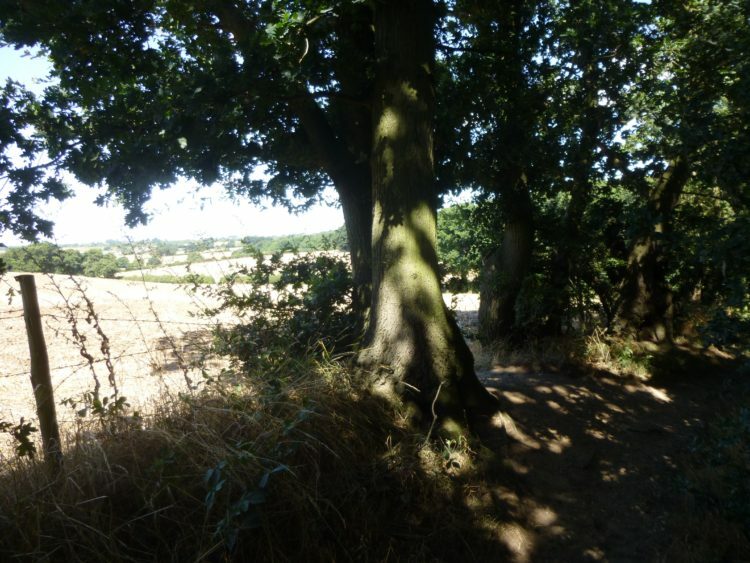 When I first visited the wood in January, I took the wrong track from the church and ended up entering from the ‘back gate’, the southern-most edge of the wood. 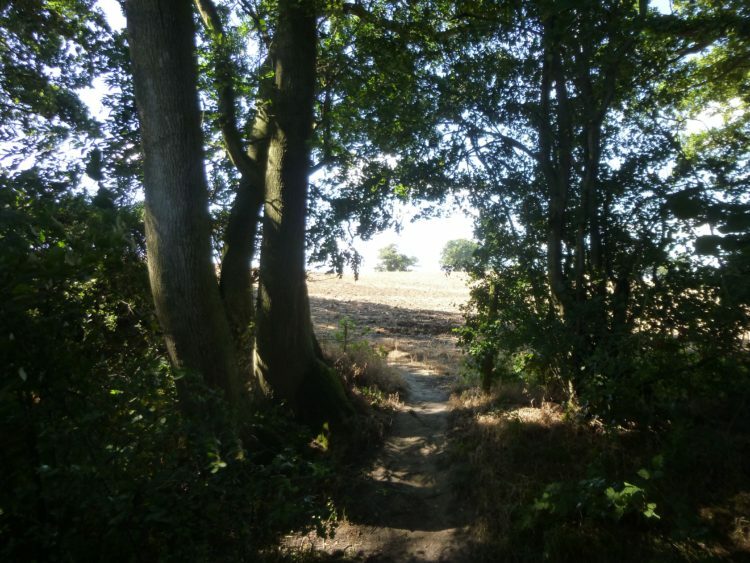 This time I managed to re-find that little gateway from the inside as it were, and get out into the stubble field beyond – there are several little gaps through the tree line. There is a little wooden kissing-gate at the southern entrance, and this is going to be the subject of my eighth painting. Two thirds of the way through this project, now! It has been so interesting, and I already have quite a few ideas about ways I’m going to use the images when I’ve finished. The paintings of Essex Wood: January, February, March and April are at present on show as part of my solo exhibition at the Naze Tower at Walton, and Essex Wood: May and June are at the Haylett’s Gallery, Maldon, as part of my contribution to Essex Women Artists exhibition. There are just three more weeks to see these two shows, as they both end the first weekend in September. Yesterday Graham and I went over to The Fry Gallery at Saffron Walden. It was a very pretty drive, as the sat-nav took us through all the little villages, and the countryside at this time of the year is so lovely. We arrived too early, as the gallery doesn’t open until 2.00pm, so we went to The Eight Bells in Saffron Walden, and had a really delicious lunch in the converted barn restaurant at the back of the pub – I would strongly recommend it if you happen to find yourself in the area! 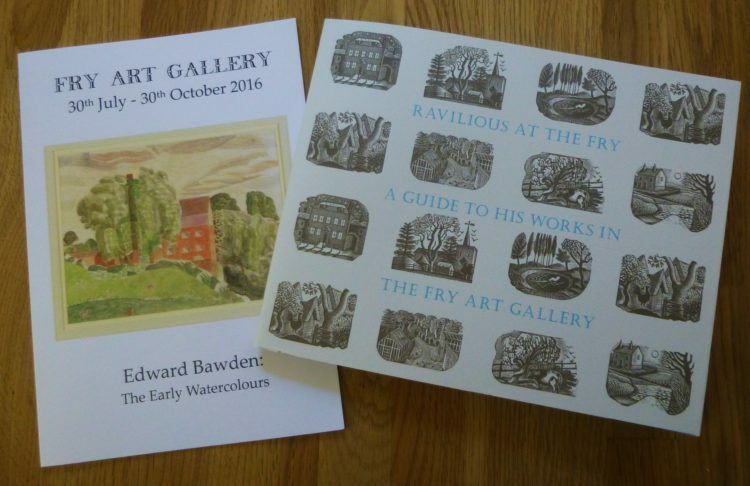 The special exhibition on at the Fry at the moment is of Edward Bawden’s early watercolours, but I have to say I was more interested in the wall full of Eric Ravilious’ watercolours, and the opposite wall full of Bawden’s huge and colourful lino prints. 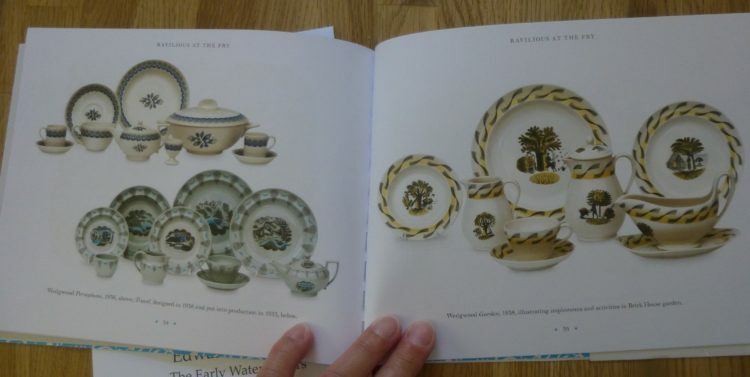 I loved all the ceramics in a little side room, too, designed by Ravilious for Wedgewood – and we have resolved to see if we can hunt down any examples! 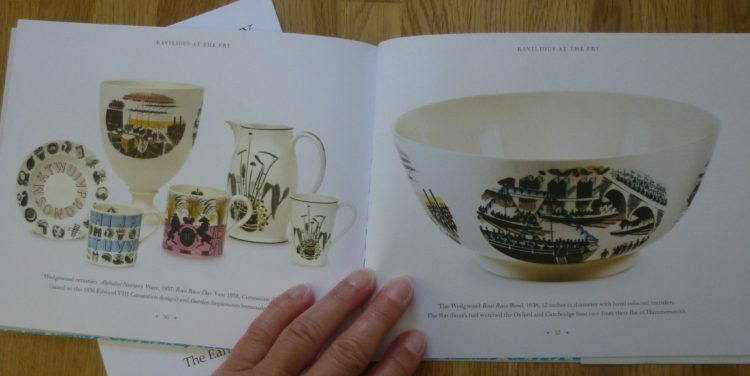 There is a very nice little book – only £4 – which details all the work by Ravilious in the collection, and it has some lovely photos of the ceramics near the back. 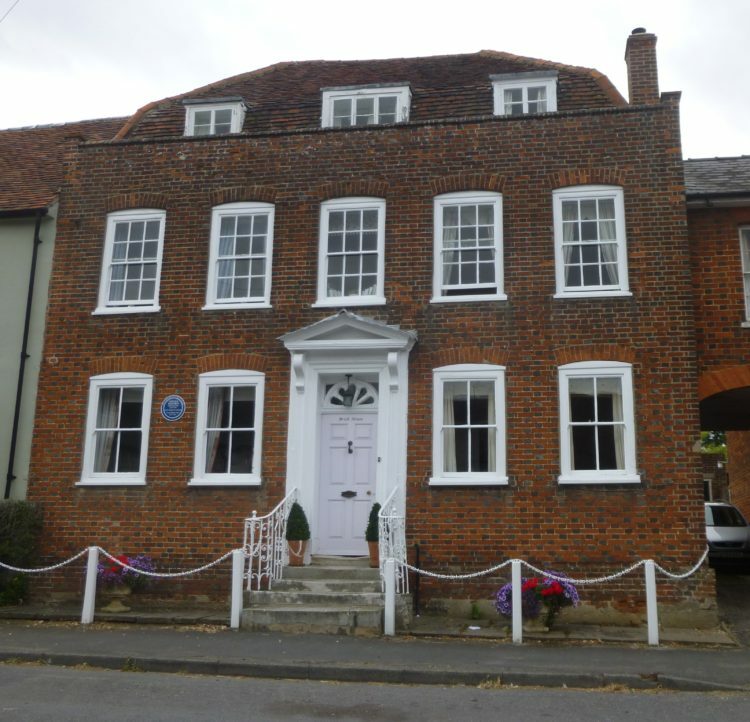 When we left Saffron Walden we went to Great Bardfield, the unlikely base for a whole group of artists, after Bawden and Ravilious first settled there with their wives, Charlotte and Tirzah, at Brick House. It is still a very attractive village, and after a bit of wandering round we found Brick House. 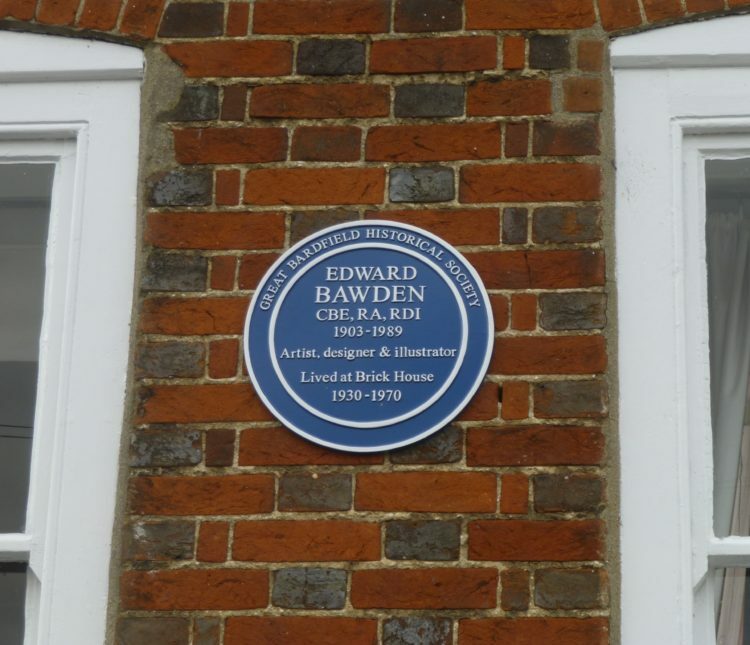 It is very imposing, and, as it says on the blue plaque, Bawden lived here for 40 years, although Ravilious and his wife moved after a while to nearby Castle Hedingham. 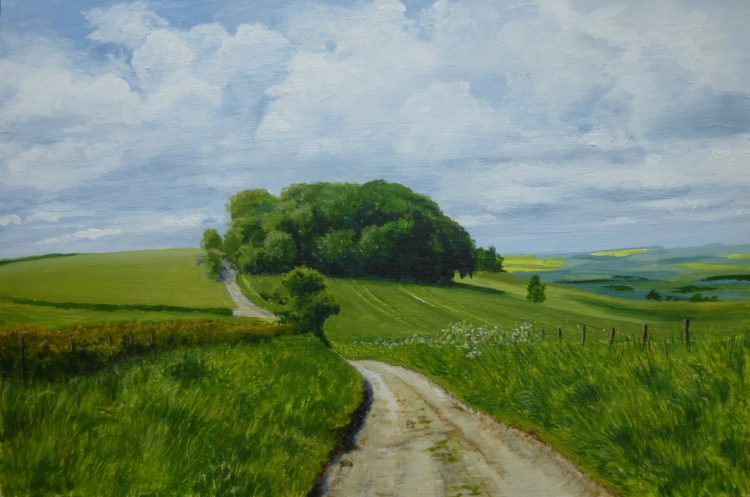 So, here is the first completed painting in what will be a series of The Ridgeway, resulting from my trip to Wiltshire in the spring, and wonderful walks along sections of this ancient track. I had planned for there to be six paintings in the series, but looking at my drawings and photos recently, I’m pretty sure there will be more! This is looking southwest on the walk back from Barbury Castle to Hackpen Hill, on my second day walking. 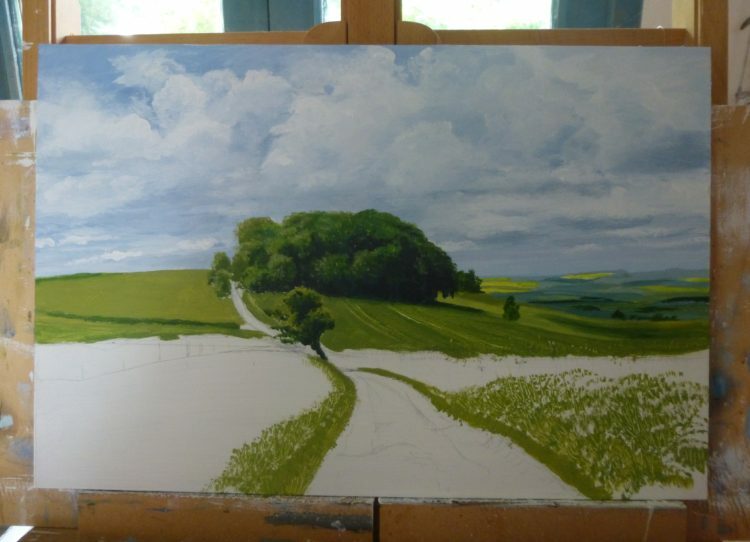 I have realised that I’m not painting the views in the ‘right’ order – in other words, in the order which the views occur, starting from Overton Hill where the Wiltshire Ridgeway starts: so, for now, I’m just going to number them in the order that I paint them, and then – when I’m quite sure the series is complete – I will re-number and name the whole lot in ‘geographical’ order – if that makes sense! 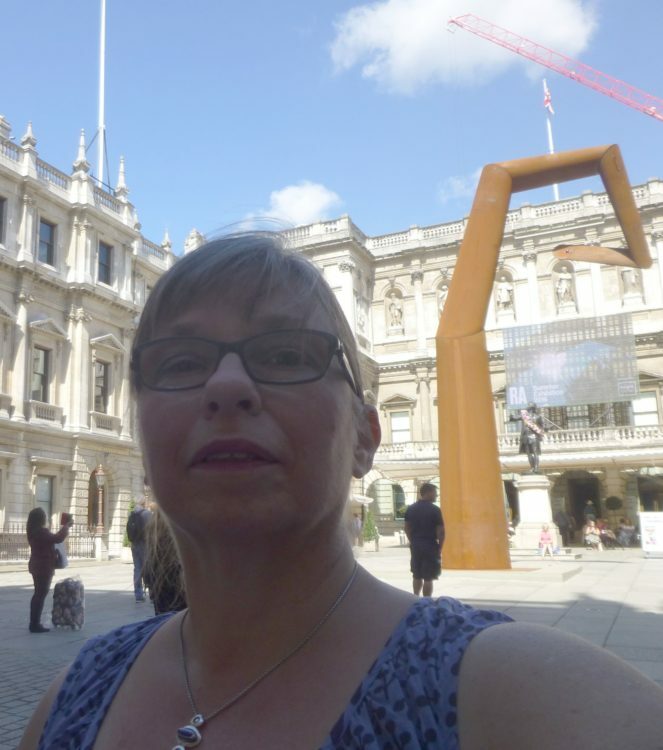 Today I had another trip to the RA’s Summer Exhibition, this time with my niece. And as usual, I noticed works that I hadn’t seen at all last time! Ron Arad’s ‘Spyre’ was still twisting about in the courtyard, and we actually managed to get ourselves ‘seen’ by it this time. 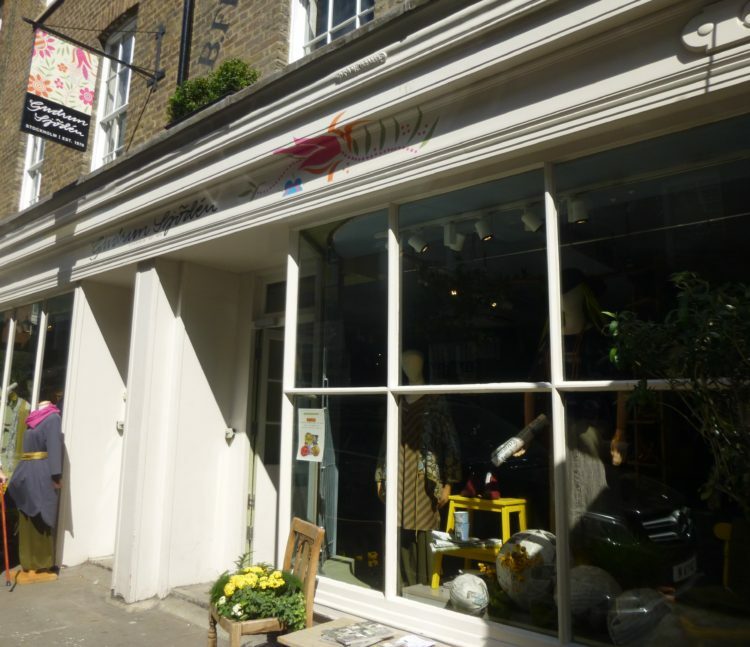 After Claire had set off back to King’s Cross I went to Covent Garden to my favourite shop in London – Gudrun Sjoden in Monmouth Street . . .
. . . and came out with a dress, a pair of trousers, four pairs of very pretty socks, a FREE scarf, and a ten pound voucher for next time! That’s what I call a successful visit. AND I caught the 4.00pm non-stop train back to Colchester, which was a bonus, as it was very hot in London, and I was very glad to be whizzed back to the cool shade in my garden, and sit in my recliner for a while with bare feet and a large mug of tea! 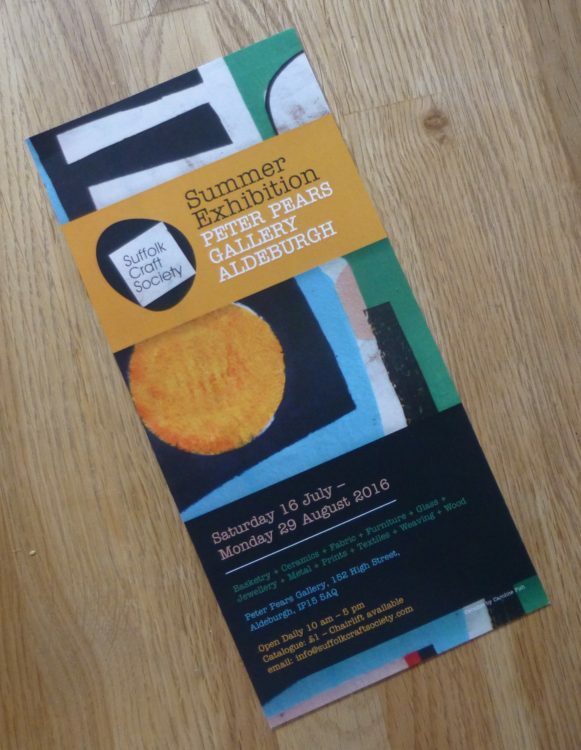 Last Saturday Graham and I headed up to Aldeburgh to the Peter Pears Gallery for the Suffolk Craft Society’s annual summer exhibition. 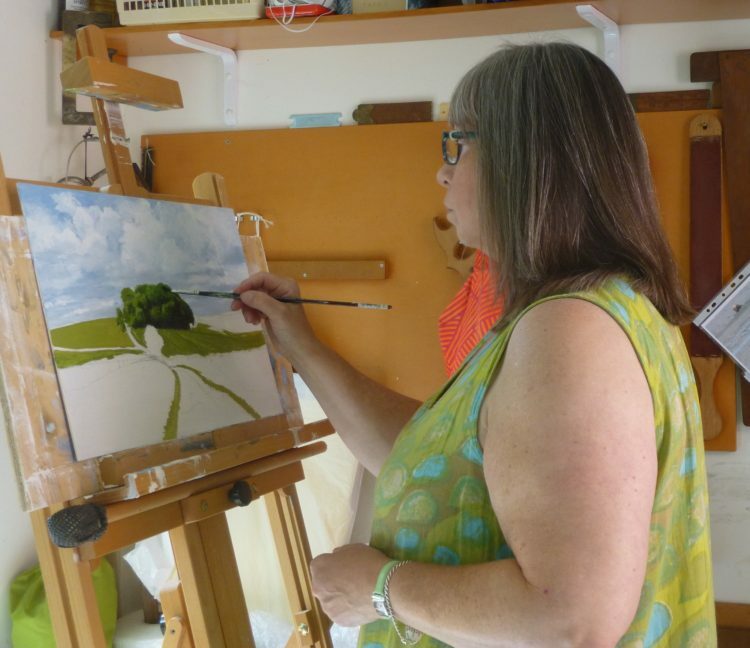 Several members have exhibited work with us at the Lexden Arts Festival over the years, and it’s always interesting to see the new work – and of course, work by new members! We both agreed it is the best show they have put on for some years, and especially liked the more streamlined way in which it was set up – not nearly so cluttered looking, but still lots of work. 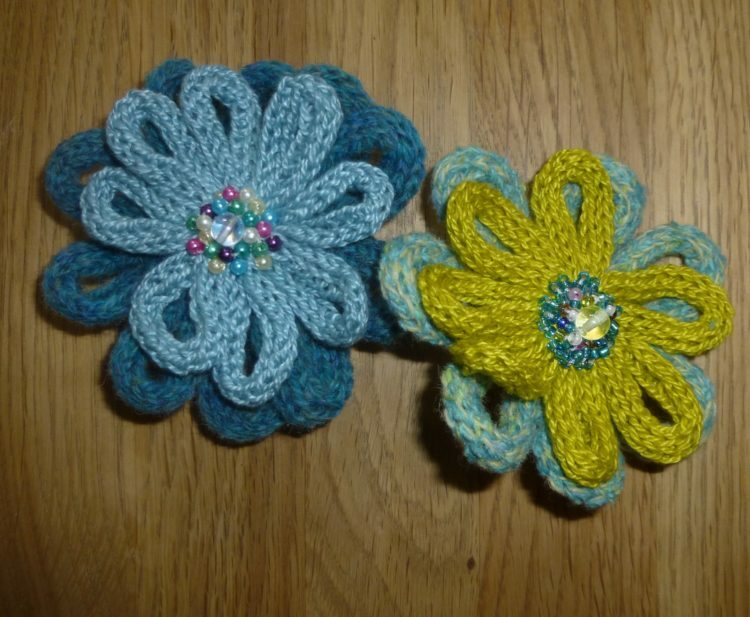 Caroline Sullivan, who will be showing at LAF again in 2017, had lots of her lovely knitwear designs – and some little fun things, too, like these knitted brooches . . .
. . . which I couldn’t resist! We particularly liked Greta Hansen’s wood-cut prints, and I’m delighted that she has agreed to show at next year’s LAF, and I have hopes that the jeweller, Alison Dane, whose colourful work is very appealing, will also agree to show with us. Lunch at the Crossed Keys, and a quick stroll on the beach (not really the weather for it! ), followed by a look round Thompsons Gallery, and then down to Snape Maltings for a wander round and then tea and cake concluded a happy Saturday. And back home in my studio? 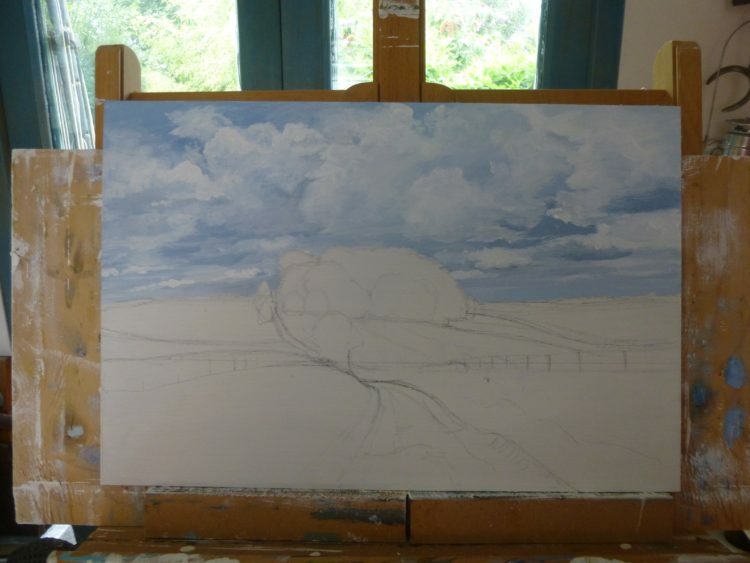 – I’m just beginning the first of my Ridgeway paintings (read all about my walk on the Ridgeway in the May 2016 archive) . . .
. . . although I’ve also got five notarial faculties to complete this week, so progress may be slow!